The Osborne eCold 220ES Undercounter Sliding Door Bottle Cooler is the ideal solution for busy bars with limited space. 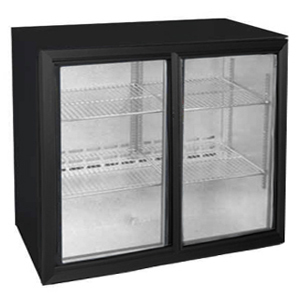 This 200 bottle cooler has sliding doors for easy access to contents and has a clearly lit glass fronted display. Manufactured from commercial quality materials, this cooler features a rust resistant zinc-coated steel body with a hard wearing powder-coat finish. Designed to be highly efficient, this cooler offers excellent insulation with minimum maintenance.